Among all the events which make Madrid the most magical city during the Christmas holidays, the Three Kings Parade is, without doubt, the favourite amongst children. The classic welcome to Their Majesties fills the streets of the Spanish capital with joy and hope, an eminently Spanish tradition that you can’t miss out on if you are in Madrid on this date. 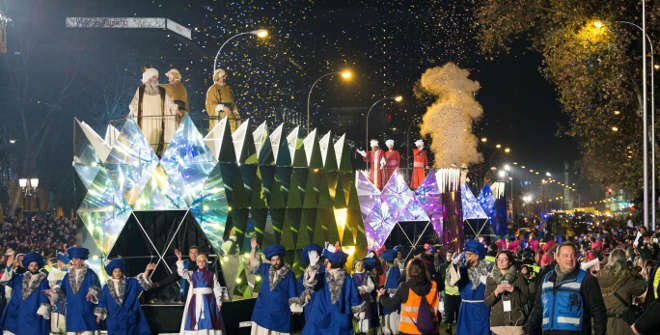 The Three Kings Parade takes place on January 5 of every year, starting at 6.30 p.m. approximately. The coaches are one of the evening’s main attractions and they transport the three kings, Melchor, Gaspar and Baltasar along with their page boys and helpers, throughout the most emblematic streets in Madrid. Most of the route is along Paseo de la Castellana, starting at Nuevos Ministerios. However, what is worth seeing the most is the final firework display when Their Majesties reach Cibeles. The urge to take part in this tradition is so big among children and adults that we cannot recommend enough that you get to your viewing spot with plenty of time. Another important detail is to go with empty pockets. Why? Because you’ll need the room to fill them with the shower of sweets you will pick up that makes the parade so special. The Spanish capital is, without doubt, the best place to enjoy this time of year. The Christmas charm floods its streets, from the public lights to the Christmas trees located strategically around the city as well as its charming Christmas markets. The different ice rinks which are set up every year in Madrid are also a fantastic option for fun on these dates, a great chance to try new things and for children to fully enjoy the Christmas spirit.